Having made myself nearly physically ill from the number of truly lame “I didn’t know I was really a vampire or a werewolf or a fairy or another previously unknown magical beast until I became a teenager and got sent off to boarding school” titles, I am perilously close to washing my hands of the whole genre. In an effort to still love fantasy, I have purposely cast the SFF net much wider to find titles that won’t sicken me or my readers. Lots of good stuff here -- and nothing that sounds like a Twilight copycat, I promise. Mythology fans (and anyone who got a kick out of Harry Potter) should seek out Belinda Weber’s Fabulous and Monstrous Beasts. This oversized hardcover includes everything from the usual suspects (dragons, unicorns and mermaids) to those that rarely see face time in such titles (the chimera, harpies and cockatrice). What really sells it though is the combination of oversized, colorful illustrations (which include not only the creature of choice but also the area in which it lived or humans it interacted/fought with) and a big dose of history in small snippets explaining just how they came to be part of our culture. Weber also includes reproductions of objects such as plates, tapestries, sculptures, totem poles, etc., to show how the creatures have been depicted over the years. I read Fabulous and Monstrous Beasts expecting to learn a bit but was impressed by how Weber tied so many different national histories into her overview. From King James VI of Scotland incorporating unicorns and lions into his royal insignia (showing unity between England and Scotland) to the statue of the “puushamriga” or Indian Sphinx, she has mined the world for fascinating information. Likely the coolest bits for most readers will be the ongoing mysteries, such as the 1951 photograph of a footprint of an abominable snowman on Everest or the photo from 1977 of a “sea monster” carcass off the coast of New Zealand (it looks nothing like a whale or giant squid). The author is forthright about the myths that have been disproven (the 1934 photo of Nessie is explained) but she leaves enough questions out there about others to stir a lot of curiosity among readers. Overall this is a splendid collection of history, mythology and even science that should spark a lot of further research. Zetta Elliott’s time travel novel A Wish After Midnight is a bit of a revelation. You have an African American teen protagonist living in modern times who struggles in general with all the issues a single-parent household might face and in particular from having a selfish older brother and sister. Genna is a smart kid who loves Brooklyn but doesn’t like how tough life is becoming or how her mother is so ground down with worrying about (and overlooking the faults of) her brother and sister that she seems to give Genna an extra helping of difficult every chance she gets. The teen spends many of her afternoons at the Brooklyn Botanic Garden dreaming of some way to gain control of the chaos at home. When she meets the brilliant and charismatic Judah it seems that life will get better but instead things spiral out of control. Any book where a black teenage girl travels back to the time of slavery is likely to face comparisons with Octavia Butler’s Kindred. Elliott is telling a very specific story here though -- one about Brooklyn and what it faced during the 1863 draft riots and also what it would mean to be a young black person alive in that specific place and time. Genna does suffer horribly when she travels back and Elliott doesn’t flinch from the realities of slavery. But more importantly, readers will find not a historical tale so much as a story about how a very contemporary teen would see that time and how she would react to it. I love that Genna is pragmatic enough not to sit around and whine for long. Life might be crazy but she still has to eat. (This is the same Genna as presented in the modern part of the story and it’s wonderful to see her not lose her mind when transported back.) She makes friends, finds work that puts a roof over her head, bites her tongue more than once and basically builds a life always hoping against hope that somehow she will get home to her Brooklyn again. When New York finally explodes, Genna gets swept away in the conflict between the have-nots and have-less. This is where Elliott really excels, showing the frustration of those who instigated that violence and the courage of those, black and white, who stood up to it. It’s vivid, violent and impressive history and just like Genna most teens will be shocked to see what happened in New York City, so far from the Civil War battlefields but scarred by war all the same. A Wish After Midnight is a self-published book -- the first I have ever reviewed here. Hopefully a publisher interested in a coming-of-age story in the science fiction tradition of Butler, Connie Willis, and even Walter Mosley’s 47 will give Elliott the time and attention her work merits. Oni Press has been publishing the graphic novel adventures of Ted Naifeh’s quirky heroine Courtney Crumrin for several years now and most recently issued a very unvampire vamp tale, Courtney Crumrin and the Prince of Nowhere. (Originally published as a standalone story it is now available in the collection Courtney Crumrin’s Monstrous Holiday.) This story is the antidote to everyone who is tired of seeing vampires portrayed as the answer to every teenage girl’s lovelorn dream and really wish that Buffy was around to stake Edward. (He wants to eat you, Bella! This is not a solid foundation to build a future on!) Courtney is a pragmatist who along with her relatively useless parents lives with her Great Uncle Aloysius in a house right out of Edward Gorey and surrounded by a variety of mysterious creatures like goblins. Courtney is not the weep and run type (if she was her vacuous parents would have driven her to severe depression years before). Through a succession of past adventures she has met challenges of all sorts, made a few friends (but not many) and deemed herself as someone of interest in the eyes of Uncle Aloysius. It is because of this that they have now embarked on a European vacation together. In Prince of Nowhere they arrive in Germany and visit Castle Krumrhein. Wolfgang shows Courtney around the castle and she finds herself identifying more with him then with anyone else she has ever known. The plot complicates when she finds out why her uncle came to this particular place and who he needs to meet. Choices must be made and for once, Courtney thinks about choosing for herself. But she goes in with her eyes wide open; she is not blinded by romantic thoughts. In the end she is herself, still braver than most, but unrelentingly realistic. The subtle fantasy Water Steps is a perfect blend of coming-of-age story and mythology (a la The Secret of Roan Inish). You have to stay with this one for awhile before the fantasy elements to unfold but by then readers will have become so involved in eleven-year old Kyna’s life that the big reveal is mostly just icing on the cake. In the opening pages we learn that Kyna is terrified of water -- not just large bodies of water but everything from bathroom showers to the tub used for dunking apples at Halloween. At first this fear seems to be overkill but then author A. LaFaye reveals that Kyna’s family was killed in a boating accident from which she, as a toddler, was the sole survivor. Adopted by the couple who saved her life in the storm, she has continued to struggle with water terror ever since. As Water Steps opens, “Mem” and “Pep” surprise her by announcing they are all going to spend the summer on Lake Champlain. Just physically being that close to water is an epic trial for Kyna and all the stories she hears about “silkies” who dwell in the lake do nothing to make it more compelling. Determined to stay far from the waves she resolutely pursues her land-based Girl Scouts badges and makes friends with a younger boy who lives nearby. He wants to track silkies while Kyna hopes to photograph birds. Slowly, over time, she gets closer to the water until the day she pushes herself to be as brave as she can be and save her friend when the waves come just a little too close. Stories about silkies abound here, and fit well into the narrative as Kyna’s adoptive parents both come from Ireland and many of their conversations with her are steeped in tales of their homeland. The longer they spend at Champlain the more Kyna begins to wonder about their past and when she meets a few of the relatives the many things she doesn’t know about her family begin to stack up. Along with her friend Tylo’s determination to sight a silkie, Kyna finds her summer full of many more questions then she planned and all the answers -- no surprise -- point toward the water. In the end the book is very much a “heartwarming summer’s tale” that should be pitch perfect for Celtic curious middle grade readers who want to identify first and foremost with their protagonist without being swept away by the plot’s more fantastic elements. It’s a gentle story that should be well received. Finally, venerable editor Sharyn November released the latest entry in the Firebirds series of speculative fiction with Firebirds Soaring last December. As usual the list of contributors is impressive, including Carol Emshwiller, Nancy Farmer, Jo Walton, Jane Yolen and Adam Stemple, Margo Lanagan and Ellen Klages. There are many standouts to be found here and readers are going to find favorites among the eclectic collection. I found Nancy Springer’s train travel story, “A Ticket to Ride” particularly enjoyable as it combined the romance of riding the rails along with the fantastic suggestion that a particular train (and ticket) could take you to a place you never imagined. (It also starts in a library thus combing two of my lifelong favorite things.) In “A Thousand Tales,” Christopher Barzak returns to a favored setting with an Asian tale of transformation and empowerment that says more about young girls and what they must fight to accomplish then it does about sly foxes -- nicely done. Ellen Klages proves yet again that closets are mysterious places and sometimes it is more worrisome to trust friends than strangers in “Singing on a Star” and the strong pull of home and family who love you is perfectly illustrated in Louise Marley’s “Egg Magic,” a story that any teen who has felt bored by the same old thing will hopefully read with a deep appreciation. Marly Youman’s “Power and Magic” written, she explains, “for my magic-loving teenage daughter who finds that real boys can’t compete with make-believe ones” delivers a special brand of Georgia cool and a wonderful boy who is everything those vampire boy toys will never be. (You heart will simply melt over Erl Jack.) “Little Red” from Jane Yolen and Adam Stemple is a vivid dark story of a teenager in trouble, one who can not go home and pines for survival while trying to kill herself in so many new and different ways. Red is brave and resolute while she struggles through abuse and ignorance. “We get a new therapist the next day. We’re always getting new ones. They stay a few weeks, a few months, and then they’re gone.” Red has demons on her trail but she fights them off; she fights everyone. Girl Interrupted indeed -- Yolen and Stemple give us the read deal of teen trauma with “Little Red” and it will likely leave readers trembling. The anthology’s big treat is Nina Kiriki Hoffman’s dragon novella, “The Ghosts of Strangers” which combines more than one fantasy element (dragons and ghosts) into a tale that turns what you might expect onto its ear and shows how powerful personal courage can be. Taken together the entire book is an excellent place to discover authors you love, characters you can’t forget and fantasies few of us can imagine. Until next month you can catch me at chasingray.com where the Summer Blog Blast Tour will be running the week of May 18th. Also check out Guyslitwire.com for new recommendations for teen boys from a group of bloggers with a wide range of interests. Awesome stuff for anyone looking for a good book. Cool Reads: Sy Montgomery has written a lot of wonderful nature books for both children and adults. She has lately become a mainstay of the Scientist in the Field series from Houghton Mifflin Children’s and her animal loving memoir, The Good Good Pig, was a bestseller in 2007. 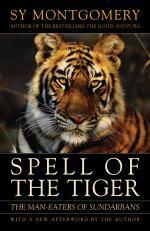 Recently Chelsea Green has reissued some of her earlier nature titles and after reading Journey of the Pink Dolphins: An Amazon Quest and Spell of the Tiger: The Man-eaters of Sundarbans, I am now a committed Montgomery fan. What makes her standout for me is that Montgomery writes not only about the science of the animals she is investigating but also the mythology and folklore surrounding them, the people who live near them and those who study and manage them. She takes a broad view of nature, seeing the creature and its entire environment. I love the Boston Globe quote about her, that she is “part Indiana Jones and part Emily Dickinson.” If you wonder, like I did, how that is possible then you simply must read these two books. 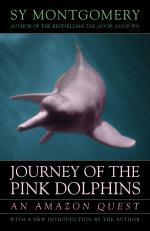 Teens in particular should embrace Dolphins and Tiger as they carry a heavy dose of adventure from the very beginning. Just getting to the Amazon in order to study the pink dolphins is an exercise in endurance and as for the Sundarbans, the swamp and delta that lies between India and Bangladesh where the only actual man-eating tigers in the world live (and hunt), well it’s right out of a 19th century journal of intrepid woman explorers. The two books excel in stories of wildlife encounters both expected and not (rats and bugs are especially prevalent in the Amazon) but it is the many ways in which Montgomery reaches far beyond the traditional confines of nature reporting that will impress her readers. There is a wealth of fascinating information in both of these books that extends into the realm of how people live with these particular animals and further, how they live with the wild in general. Sy Montgomery is clearly someone with an innate sense of curiosity. Combined with an extraordinarily elegant writing skill (echoes of Barry Lopez) she is a nature writer who must not be missed. Mandatory reading for teens looking for their own summer adventures and especially those worried all the great discoveries have been made. Sy Montgomery is a pied piper for those bored with the same old thing; read her and find the world.